I’ve been trying to give up pro football — what with the brain injuries and ee-long-gate-ed games (commercials, commercials, commercials!) — but, man, it’s tough to stay away from the TV when you have a game like the one last night. At least two KC Star sportswriters called the game an “instant classic,” and who could disagree? The Chiefs, in case you somehow missed it, won the game against Denver on a last-second, overtime field goal that banged hard into the left upright and caromed to the right at a near 90-degree angle but somehow slid behind the right upright, meaning…THE KICK IS GOOD! I alternated between watching the game — which I was convinced the Chiefs were going to lose — and doing my Spanish homework. (Patty and I take a Level 1 class Friday mornings at Second Presbyterian Church.) I gave up after the Broncos scored a touchdown with three minutes left in regulation, giving them a 24-16 lead. With the Chiefs’ achingly anemic offense, eight points seemed impossible. So I turned off the TV and went back to translating Spanish sentences. Then, with the intention of making sure the Chiefs had lost before going to bed, I went to the ESPN website and saw, almost disbelieving, that the game was in overtime. When I got back to the TV, Chiefs’ kicker Cairo Santos was about to kick a 37-yard field goal to tie the game at 27. A couple of minutes later, the Broncos unwisely attempted a 62-yard field goal, which squirted low and wide left, resembling one of my snap hooks on the golf course. That gave the Chiefs the ball near midfield, and soon enough they were in position to attempt the game-winning field goal. Santos’ kick arched high and toward the left upright. At first I thought it was going to pass just inside the upright. Then I thought it was going to leak left. Then it straightened out. When it hit the post, I thought it bounced slightly back toward the field, in front of the right post. That would have meant it was no good because, for a kick to be good, the ball has to go through the two posts. Doesn’t matter if it falls through or caroms through; it just has to go between the posts and over the crossbar. For a moment, even the TV announcers were confused. But then I saw that each of the referees standing under the respective posts was holding his hands upward and apart — the standard indicator that a kick is good. …A lot of times when watching sporting events, I get very excited and yell and cheer and curse. With this game, though, I just sat on the edge of my chair and watched. My eyes were wide, and my mouth was open, but I didn’t utter a word. Then, I went to kansascity.com to read the sportswriters’ tweets — which they post as a sort of running commentary throughout the game — and to see photographer David Eulitt’s photos. 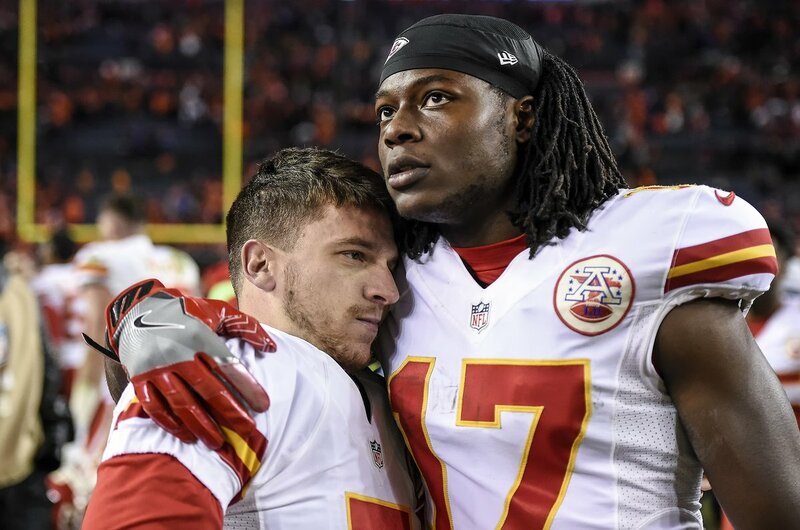 Shortly before midnight, Eulitt posted this photo of Chiefs’ wide receiver Chris Conley hugging Cairo Santos. From their expressions, you wouldn’t know the Chiefs had just won the game. It’s a picture of spent emotions…And it reflects exactly how I felt. Totally agree. In spite of myself I was watching and cheering. Everybody loves a winner, right? Great picture! Great game, the kind of game that takes a team to the Superbowl. Didn’t the Royals teach you anything after Oakland and Houston? It’s just my nature, Ned…Doubting Thomas syndrome.